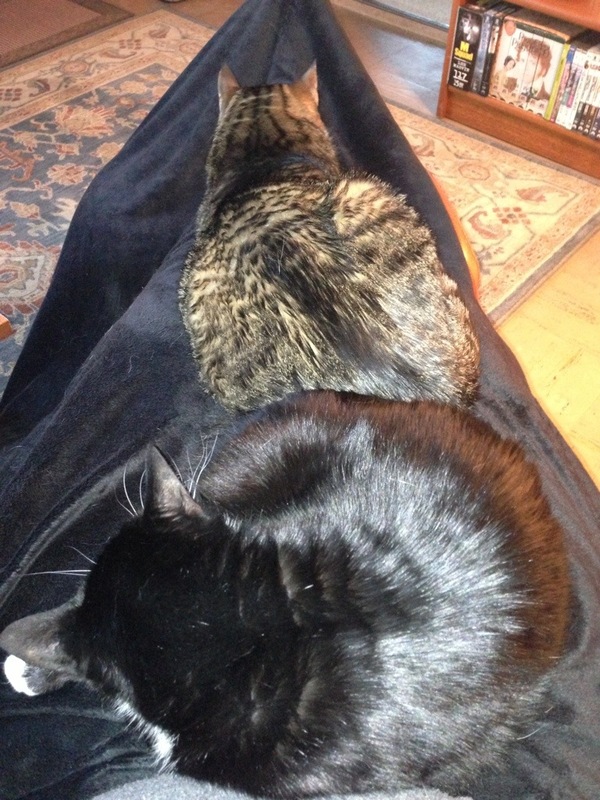 It’s hard not to get centered and still when you have two cats stretched out on your legs helping you say Morning Prayer. What aids to prayer have you incorporated into your daily practice? Do you have a favorite place to sit? A mug of coffee or tea close to hand? Music, or silence, or some of each? A favorite picture or icon to look at? What helps “exalt you to that place where our Savior Christ has gone before,” in the words of today’s Collect (BCP 226)? This entry was posted in Daily Office and tagged Dewey, Morning Prayer, Sock Monkey on May 12, 2013 by Rodger Patience. For personal offices, I usually sit on the patio with some coffee. Family offices are said at the family altar. On holy days or feasts significant to our family, we bust out the incense and plainchant. Derek, I’m glad you dropped by. I’d be very interested to see a photo of your family altar if you care to share one. Good luck on your blog, too, a very promising start!